The guy who tops the list of those responsible for sabotaging the world’s economy is lobbying to be the next chairman of the Federal Reserve. 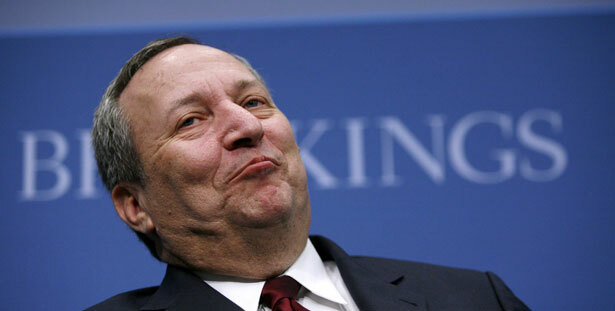 Tell me it’s a sick joke: Former US Treasury Secretary Lawrence Summers, the guy who tops the list of those responsible for sabotaging the world’s economy, is lobbying to be the next chairman of the Federal Reserve. But no, it makes perfect sense, since Summers has long succeeded spectacularly by failing. Why should his miserable record in the Clinton and Obama administrations hold him back from future disastrous adventures at our expense? With Ben Bernanke set to step down in January, and Obama still in deep denial over the pain and damage his former top economic adviser Summers brought to tens of millions of Americans, this darling of Wall Street has yet another shot to savage the economy. Summers was one of the key players during the Clinton years in creating the mortgage derivative bubble that ended up costing tens of millions of Americans their homes and life savings. This is the genius who, as Clinton’s Treasury secretary, supported the banking lobby’s successful effort to make the sale of unregulated bundles of mortgage securities and the phony insurance swaps that backed them perfectly legal and totally unmonitored. Those are the toxic bundles that the Federal Reserve is still unloading from the banks at a cost of trillions of dollars. But back on July 30, 1998, when he was deputy Treasury secretary, Summers assured the Senate agriculture committee that the “thriving” derivatives market was the driving force of American prosperity and would be fatally hurt by any government regulation of the sort proposed by Brooksley Born, the stunningly prescient chair of the Commodity Futures Trading Commission. Consider the astounding stupidity of that statement and the utter ignorance upon which it was based. One financial CEO after another has testified to not knowing how the derivatives were created and why their worth evaporated. Think of AIG and the other marketers of these products that were saved from disaster only by the injection of government funds not available to foreclosed homeowners whose mortgages were wrapped into those toxic securities. Most of those dubious financial gimmicks were marketed by the too-big-to-fail banks made legal by another piece of legislation supported by Summers and passed a year later when Clinton tapped him to be Treasury secretary. Summers was an ardent proponent of repealing the Glass-Steagall Act that prevented the merger of highflying investment houses with traditional commercial banks entrusted with the government insured deposits of ordinary folks. The first result of destroying that sensible barrier to too-big-to-fail banks was the creation of Citigroup as the biggest bank in the world. Threatened by its wild derivative trading, it had to be saved from bankruptcy with an infusion by taxpayers of $45 billion in US government aid and a guarantee for $300 billion of its toxic assets. Summers had condemned Glass-Steagall as an example of “archaic financial restrictions” and called instead for “allowing common ownership of banking, securities and insurance firms.” A decade later, while in the Obama administration, Summers worked to prevent a return to the Glass-Steagall prohibition in the Dodd-Frank legislation. The need to restore that reasonable banking regulation implemented by President Franklin Roosevelt in response to the Great Depression was acknowledged by bipartisan legislation introduced last week in the Senate by Elizabeth Warren, D-MA, and John McCain, R-AZ. “It will take a lot of tools to get rid of too-big-to-fail, but one of them ought to be that if you want to do high-stakes gambling, good on you, but you do not get access to people’s checking accounts and savings accounts,” Warren told Bloomberg News on Friday in urging the return of Glass-Steagall. As opposed to Summers, who continued to insist on the wisdom of ending essential financial regulation, McCain, who had voted for the repeal, has seen the error of that decision. “Since core provisions of the Glass-Steagall Act were repealed in 1999, shattering the wall dividing commercial banks and investment banks, a culture of dangerous greed and excessive risk-taking has taken root in the banking world,” the senator said in a press release Thursday announcing the legislation. Even Sanford Weill, who headed Citigroup after pushing for the reversal of Glass-Steagall, had the good sense to acknowledge his mistake, saying in a statement a year ago: “What we should probably do is go and split up investment banking from banking. Have banks do something that’s not going to risk the taxpayer dollars, that’s not going to be too big to fail.” Richard Parsons and John Reed, two other former high-ranking officers of Citigroup, also have called for the reinstatement of Glass-Steagall. The question then is why Summers, the man who got it all wrong, would imagine that he could be in the running to head the Federal Reserve? Why would he ever fantasize that President Obama might turn to someone who always gets it wrong to right a still struggling economy? Maybe because he knows Obama better than we do. After all, it was a massive infusion of Wall Street money that helped Obama get elected both times. And Wall Street, which showered Summers with almost $8 million in speaking fees and hedge fund profits during the 2008 campaign while he advised Obama, clearly would approve of this greed enabler as the next Fed chairman. Elizabeth Warren calls out the Fed.